Completed “The Man with the Guardian Spirit”. Witnessed Tokugawa’s forces head toward a decisive battle. Made two circuits around Japan. Reached maximum proficiency with your first weapon. Acquired mystic art for the sword. Acquired mystic art for the dual swords. Acquired mystic art for the spear. Acquired mystic art for the axe. 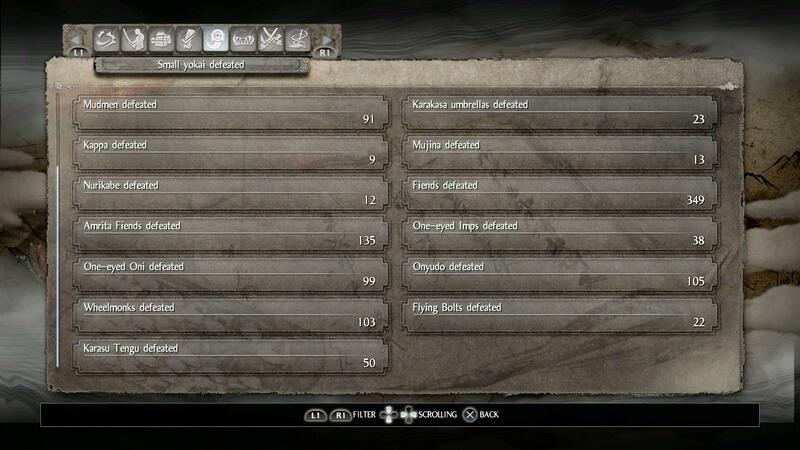 Acquired mystic art for the kusarigama. Acquired mystic art for Ninjutsu. Acquired mystic art for Onmyo Magic. Changed your hair style or beard. Changed the appearance of an item. Found Muramasa and brought him in. Made a total of 60 requests at the blacksmith. Collected all the best materials. 14. Raven Tengu Feather = Mission Reward / Twilight Missions. Also dropped by bird enemies. Completed 10 missions with NPC or in the “Yokai Realm with a companion” with other users. Communicated with a yokai 10 times. Confused an enemy for the first time. Completed your first Twilight mission. Bathed in first hot spring. 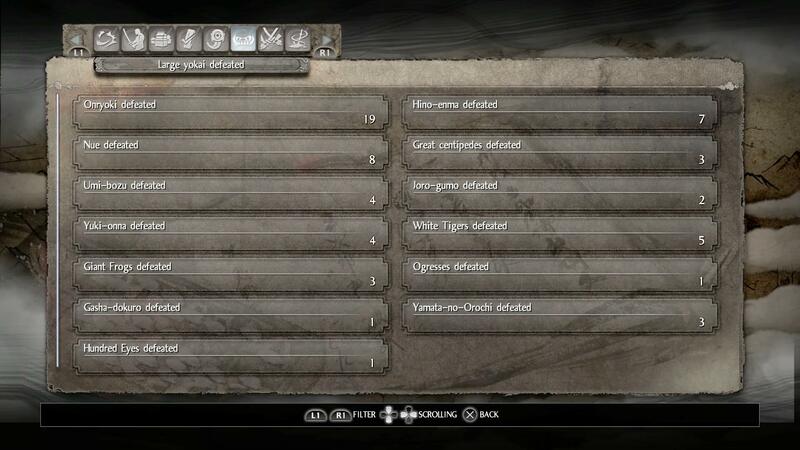 Defeated all types of yokai. Bathed in every hot spring. Became Ryunoshin the dung lover’s best friend. Used the mask of an ugly fellow to defeat an enemy. Lit all three evil-warding bonfires in Itsukushima. Defeated the Nue of Mount Hiei. Completed all Tohoku region missions. 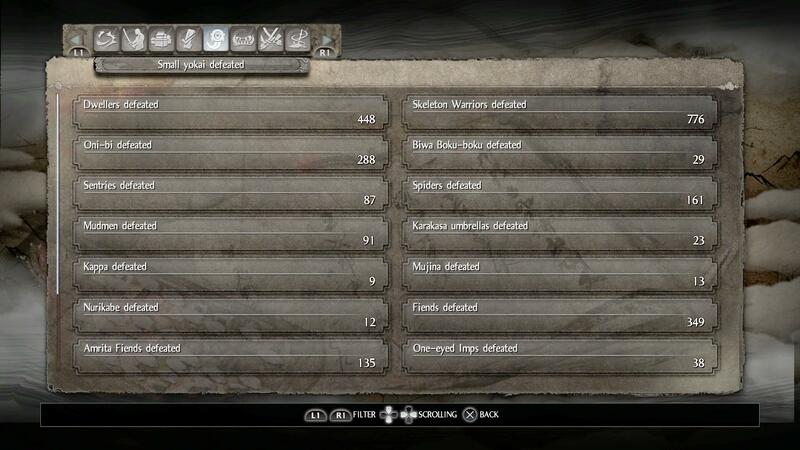 Completed all “Way of the Demon” missions. Collected all Kodama in the Tohoku region. Acquired mystic art for the odachi. Bathed in every hot spring in the Tohoku region. Completed any mission while transformed into a woman.